The Youngstown Catholic Worker is a community, founded on personal relationships, committed to learning and living the gospel of love through hospitality and peaceful resistance to injustice. The Catholic Worker Movement is an initiative with a track record of proven dedication to the counter-cultural principles of Jesus, principles that set the norms of society upside down. The Youngstown Catholic Worker Initiative is part of this movement that works stubbornly and tirelessly for peace and social justice. In a world that has excluded two-thirds of humanity from a place at the table, the Catholic Worker by its tireless activism and willingness to challenge unjust laws and social custom – even when it has meant jail time and other social repercussions – insists that the last will be first. 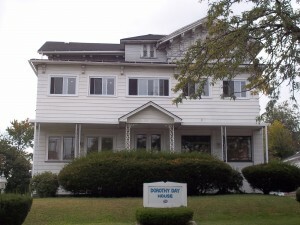 Roundtable discussions of social justice topics are held at the Youngstown Dorothy Day House on the fourth Thursday of the month from 7:00 to 8:30 P.M Our current focus has been Human Trafficking, Modern Day Slavery especially the trafficking of children. This focus now includes the plight of the refugee. We are committed to raising awareness about this most serious “crime against humanity”. Nine members of our community are trained to present on the topic of human trafficking. Please contact us at annhm@me.com to schedule one of our presenters. Also, visit our human trafficking and refugee resource page for more information. Our community of guests pray with us each Wednesday at 4:30 p.m, and celebrates the liturgy once a month, ordinarily the third Wednesday at 7:00 p.m. All are welcome! Be sure to visit all of our pages to be kept up to date with all the latest news and events in our community. Please remember to check our calendar!